LG Display Q1 profit drops as global LCD TV sales grow | What Hi-Fi? Liquid crystal display manufacturer LG Display has reported a drop in profits for the first quarter of the year, as LCD TVs become more popular in both developed and emerging markets. According to reports, the growth in sales of LCD sets in developed economies and the preference for low-margin models in emerging areas has contributed to a drop in TV panel prices. The impact on the Korean firm has been a negative one, as operating profits for Q1 fell 38 per cent to KRW94bn (£54m) – compared to KRW151bn (£86m) in the same period last year. During the same three-month reporting period, it was revealed that the average panel sale price was just $628 per square metre, compared with $697 for the final three months of 2013. 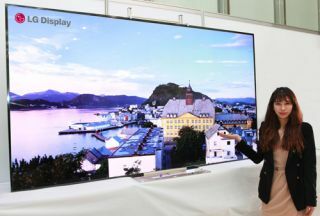 TV panel prices are, however, expected to go up during the second quarter as manufacturers – such as sister firm LG Electronics – develop larger screen products like Ultra HD 4K sets. But analysts have reportedly expressed some concern that the lack of 4K content could put off buyers for the time being, despite the improved picture quality being an obvious selling point. It's also suggested that LG Display's fortunes could be boosted by this year's launch of the iPhone 6, with the company making an increasing amount of panels for mobile devices – notably Apple's. The current speculation is that the new flagship Apple smartphone will come with larger screen sizes – and if overall iPhone sales are boosted by the new model[s], LG Display is set to benefit too.